BAD!SLAM!NO!BISCUIT! On stage! In the audience! At the bar! In the Toilets! In the Phoenix Pub! Bring words for the Poetry Slam! & the Blue Angel and Dr Wiedemann. 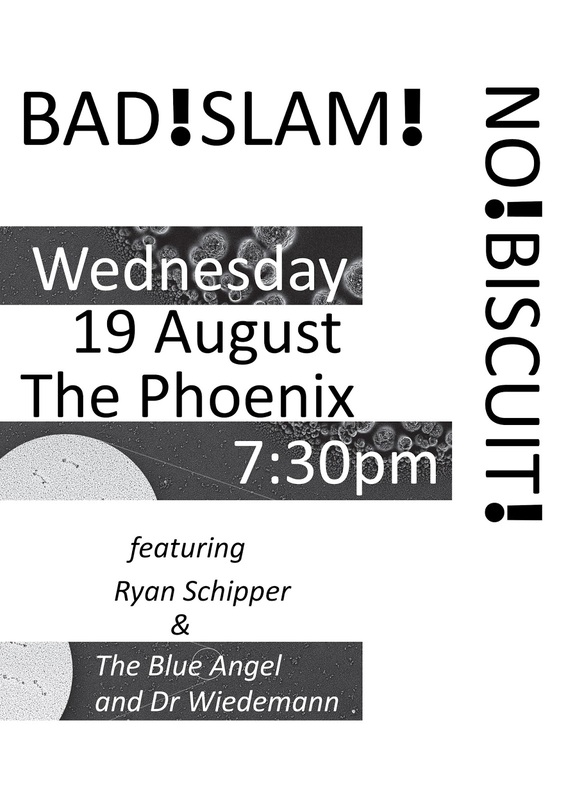 Ryan Schipper is the rotten lettuce at the back of Canberra's poetry refrigerator. While you survey half-jars of marmalade and leaking takeaway containers, Skip guards the final beer with an ascetic pestilence. Like all fridgethings, he is repulsive, but ultimately, fascinating. Arc back in time as the Blue Angel and Dr Wiedemann bring you the musty era of Weimar on a battered silver tray. Lightly philosophical and yet comical the Blue Angel and Dr Wiedemann are happy under the spot light singing and playing their original songs as well as sharing stories from another world. The Blue Angel and Dr Wiedemann are somewhat ethereal characters influenced by their own bygone ghostly past. Two minutes! No props! No music! Your original material! The Phoenix Pub! 1st Prizes! 7:30pm is the sign-up! 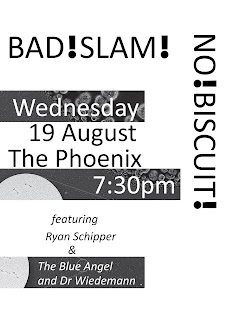 Poetry Slam at 8pm! Join the Master of Conflict, The Score Adder, Andrew Gayland and the Sacrificial Poet for Poetry!